Search for an Import. Buy a Muscle Car. Twice. The end result of my teenage labor. Does anyone else remember a time when you knew little to nothing about automobiles or the hobby in general? I do. I was raised by a family that didn’t care anything about vehicles other than spending a minimum amount of money on them, and if they had 4wd for the snow. I remember watching movies as a young teenager, still several years from a driver’s license, such as the Fast and the Furious. I didn’t know any of the vehicle model names. They were ‘that cool red car’ or green or white. I remember asking people what the red car was called (Integra) and I only knew the name for a Supra because they said it in the movie. This was a time in the early 2000s when imports were cooler and muscle car fans were much more vocal than now. You either loved imports or muscle cars. Never both. If someone mentioned their fondness for one or the other, it was time to argue about how stupid, uninformed, and slow they were, etc. etc. I made a list of cars for my 16th birthday and gave it to my dad. Integra, Civic, Eclipse, Gallant, Celica, and the rest of the 90s pocket rockets filled the pages. My dad, knowing nothing, and being mostly poor, found me an excellent condition... 1992 Ford Explorer 4x4. Cool. I kept the Explorer in top shape and learned how to work on it, but always in search of a truly cool car. I kept looking at imports, but at the time, they were much too expensive. I wanted an import! I had to have one! Everyone who had an import was trendy, popular, and got all the girls. So then how did I end up with this? 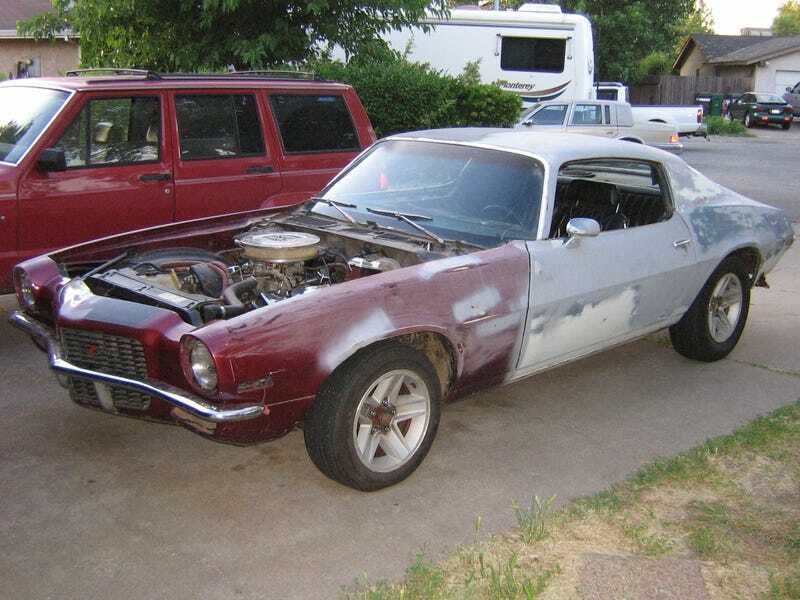 In my search for the ultimate import, I found a 1971 Chevrolet Camaro 350 for $300. Today we take for granted that most car guys can appreciate and enjoy other vehicle disciplines and styles. At the time I grew up to appreciate the car hobby, I don’t feel like this was the case. It was a polarized hobby. I was lucky to find someone that may not have been a die hard car guy but appreciated it all. I began to talk about my import dreams and learned, “I’ve got a crashed Camaro for sale”. Do tell more... I just wanted to talk cars. The image of poverty. A crappy Camaro and piles of firewood. It was rough, dirty, and not an import. It was cheap, fast-ish, and apparently people thought it could be cool... I began to listen to the muscle car guys. They all said I found a diamond in the rough. They said screw the import guys. They don’t know what they’re talking about. I however resigned myself to looking at photographs and reading about the Camaro history. I agreed, it was a worthy project, I paid the asking price. My wallet was $300 lighter. I don’t have pictures of the original front end but let me describe: The previous owner mistakenly did not bleed the brakes properly. It apparently caused him to lurch forward at a T-intersection. It was quickly stopped by a 3/4 ton pickup. The driver’s front fender appeared to be hit by a can opener just in front of the wheel. Nothing remained forward of the radiator support. After putting a battery in it, I drove it home just as it sat. Yes, the brakes were still like stepping on a bag of smashed apples and nothing existed in the realm of forward lights or bumpers. I worked on the car for several months in high school auto shop. A front end from a 1973 Z/28 was located 45 minutes from a family member in Oregon who graciously trailered it down to California. Very cheap shipping indeed. It only cost me some guilt and future yard work. The seats were NEVER bolted down. I cut my teeth on this car and learned all the nuisances and annoyances of wrenching. This ‘La Bamba’ Camaro as my uncle would later name it, was a basket case. I some how ended up driving it 2 hours away to college and continued to work on it in my shared garage with two other roommates. Almost one color, primer grey. Rebuilt heads. Firing it without exhaust manifolds was fun. Not fun for my neighbors. I eventually sold it for a grand sum of... $2300. Not exactly the best investment but the experience was essential. I learned how to wrench on the opposite of what I had intended to buy in the first place. How do you end up looking for an import and buying a muscle car? Never be phased by an unknown and never follow the cool kids. Buy what you think is cool based on your style and beliefs in speed. I never was satisfied with selling that old crappy Camaro. I had to sell it as I was moving to a location without a garage and there was no where to put it and no money to pay someone to store it. It was necessary to step up to the next in life. A couple years ago, I found myself looking for another import. I wanted a 300zx TT, Supra, NSX, or maybe an Evo. I however ran into a friend who said, “I’ve got a Camaro for sale”. Import dreams come true in muscle car reality. I think this one looks much better... what once was, came to be again.